I hosted a Lia Sophia party and made these brownies to share. I was trying to work “green” into the food since the party was on St. Patrick’s Day. The ladies all seemed to like them a lot. 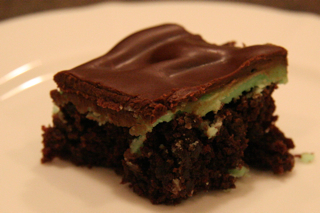 I actually used a box brownie mix and then added the mint and chocolate topping from this recipe, which I got from the All Recipes website. Preheat oven to 350 degrees F. Grease a 9×13 inch baking dish. In a small bowl, beat the confectioners’ sugar, 1/2 cup butter or margarine and creme de menthe until smooth. Spread evenly over the cooled brownies, then chill until set.